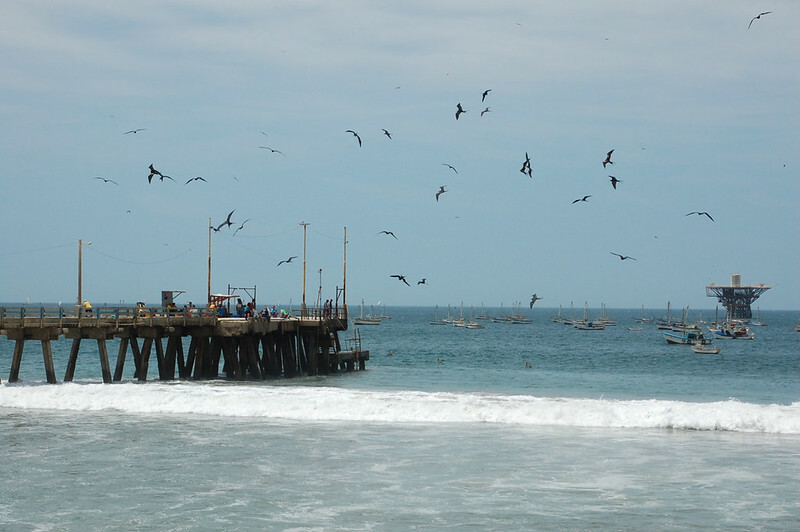 Back in the 1950s, Cabo Blanco was not just any fishing village in northern Peru. 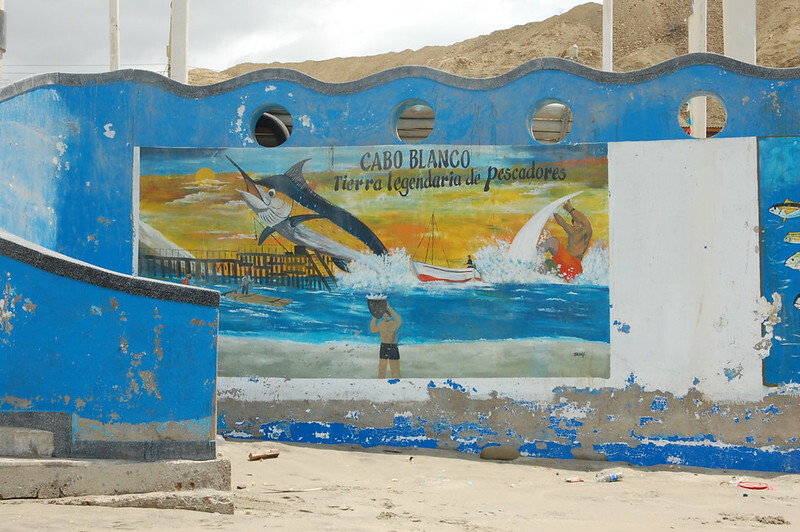 Cabo Blanco was a tiny little town very clearly marked on the map as a see-and-be-seen destination for all the famous celebrities of the time – Marilyn Monroe, Paul Newman, Spencer Tracy, Doris Day and so on. Why was that, exactly? 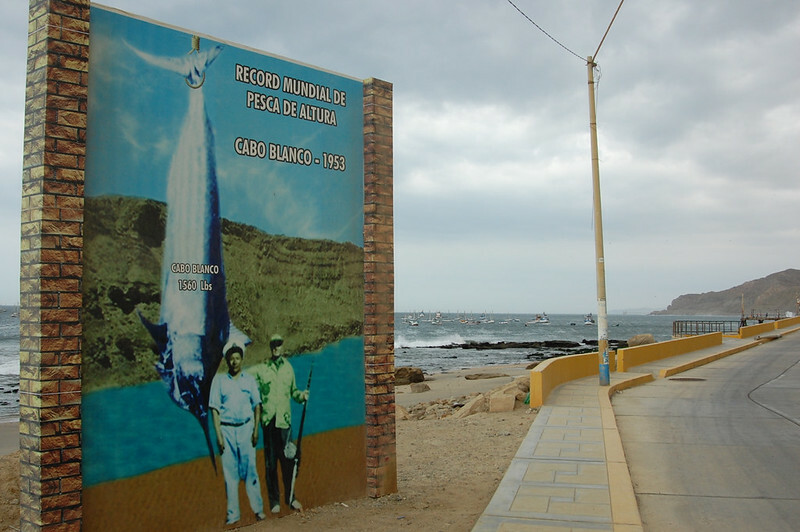 Well, in those days, Cabo Blanco was a fisherman’s paradise. Its unique location at the intersection of the El Niño and Humboldt currents keep the waters temperate year-round, which enabled plankton to grow, anchovies to feed on it, and so on and so forth, inviting giant black marlins. We’re talking big game. REALLY big. Naturally, I was curious to learn a little more about the history of place for myself. When I started dreaming up my plan to visit the beaches of northern Peru, Cabo Blanco became a must-see destination. Already in love with tiny fishing villages after my visit to tranquil Tortugas the year before, I wanted to imagine Cabo Blanco’s former glory and check out its fascinating left breaking wave. Although visiting Cabo Blanco is an all-day affair due to its isolated location, it’s straightforward. If you’re coming from Tumbes, take a combi van to Máncora, where you’ll catch another bus to El Alto. (From elsewhere in Piura, just head directly to El Alto.) On the way, you’ll climb up to the high desert cliffs and get these amazing views. El Alto is a typical industrial desert city which produces a good percentage of Peru’s oil, which makes it a pretty well-to-do city. I didn’t see much while there (I lived in the desert for a year after all), but rather continued my mission to Cabo Blanco, hopping into this combi van. 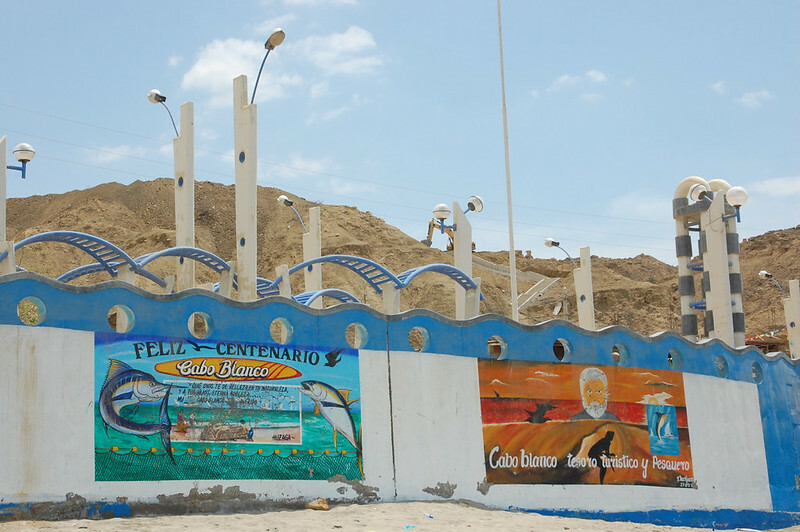 As you enter the town, you get a giant visual reminder of Cabo Blanco’s glory days. This was the world record catch of big game fish – 1560 pounds! Well, you won’t see anything like that these days; the giant marlin no longer head to these shores, a combination of overzealous sport fishing and commercial harvesting of the anchovies that the drew them there in the first place. But that’s okay. Cabo Blanco is worth a visit anyway. Like nearby Punta Sal, Cabo Blanco’s draw is that it’s an isolated, attractive beach, with a fair amount of local color mixed in. But far from the exclusive days of the past, it now has simple accommodations which are starting to cater to a new population: surfers. That’s right: surfers. Check out this incredible tubular wave. This is the longest left break in the world. I don’t know much about surfing, but I stood for quite a while just watching this tube wave break again and again. So cool! And with few people there besides the locals, it’s a pleasant place to hang out and enjoy the beaches. 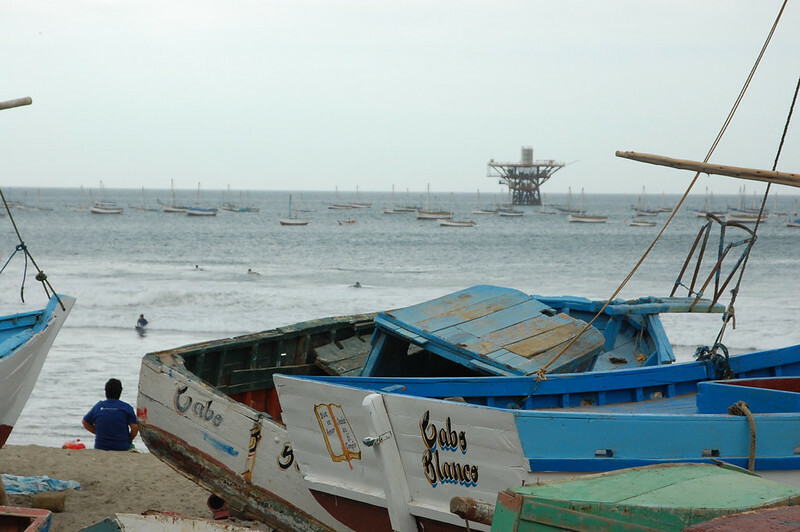 Peru’s tourism board has talked from time to time about restoring Cabo Blanco to its old glory and boosting the economy for locals, but I didn’t see much evidence of that. As I wandered up and down the beach, enjoying the sunshine that peeked out from behind the near-constant clouds during my trip, I spotted the tourist information office and stumbled into one of the best parts of my day. The friendly woman staffing the tiny tourist information office had been born and raised in Cabo Blanco and had left to continue her studies in tourism at university. But she had returned to do an internship in her hometown, determined to raise the tourist profile of this attractive town. She spoke at length about the history of Cabo Blanco, showing me pictures of Ernest Hemingway, who had stayed there while writing The Old Man and the Sea, and other relics from the era when marlin fishing was king. Over the years I’ve spent in Peru, I’ve met a number of informed, intelligent people in the tourist information offices who are determined to share the culture of their country, and this young woman impressed me with her motivation to study English and her understanding of how the youth of the town can begin to imagine another future away from commercial fishing. I was sincerely moved by her story and her dreams. Thankfully, she’s not alone in her desire to improve life in Cabo Blanco. 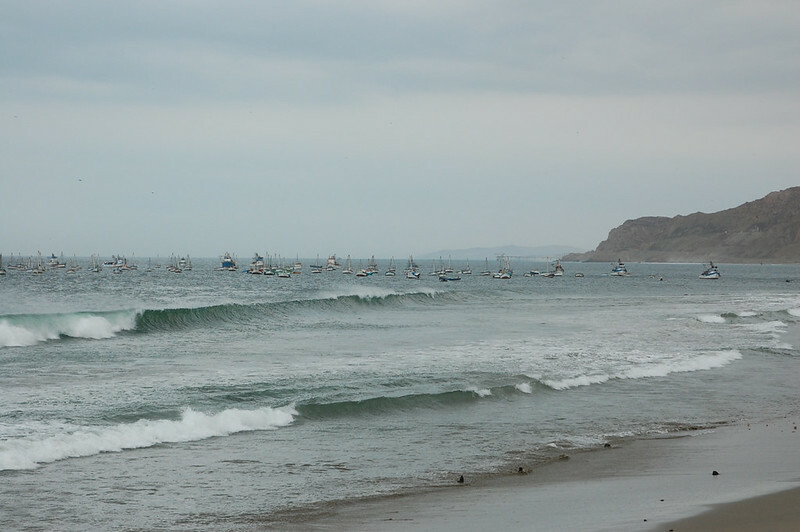 After the famous surf company Billabong hosted an annual surf competition in Cabo Blanco (which had happened the month prior to my visit), Peruvian surfers donated part of their prize money to furthering studies of the ecological system here. The Inkaterra organization has led initiatives towards marine conservation. Bringing ecotourism opportunities to Cabo Blanco could have a positive impact on the local population, both human and marine! But for now, it’s worth visiting Cabo Blanco to enjoy its quiet beaches. This guy even got involved in the fun! And as for the Cabo Blanco Fishing Club, the exclusive hotel and resort where celebrities used to hang out? Well, I didn’t quite make it there, but it’s on the other side of this cliff, about 2km away from the rest of the town. Check out the links in my recommendations below to see the strangely fascinating state of the abandoned property. In late afternoon, the surfers came out, getting ready to catch the waves. Just another day in this sleepy fishing village. 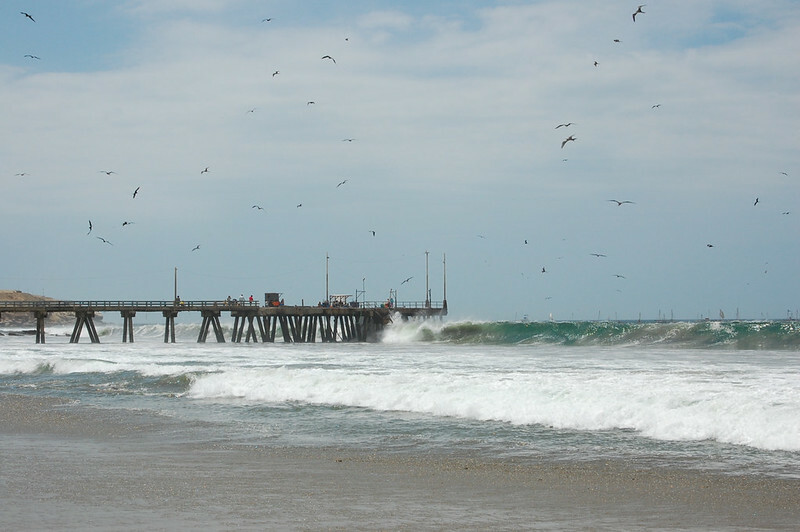 But you don’t have to be a surfer or a sport fisherman to appreciate Cabo Blanco. It suited me just fine. If you’re looking for a quiet place to spend the day on the beach that also has easy access to restaurants and tourist facilities, Cabo Blanco is the place for you. There are accommodations including a hostel that appeared to cater towards surfers, and you can probably camp on the beach. 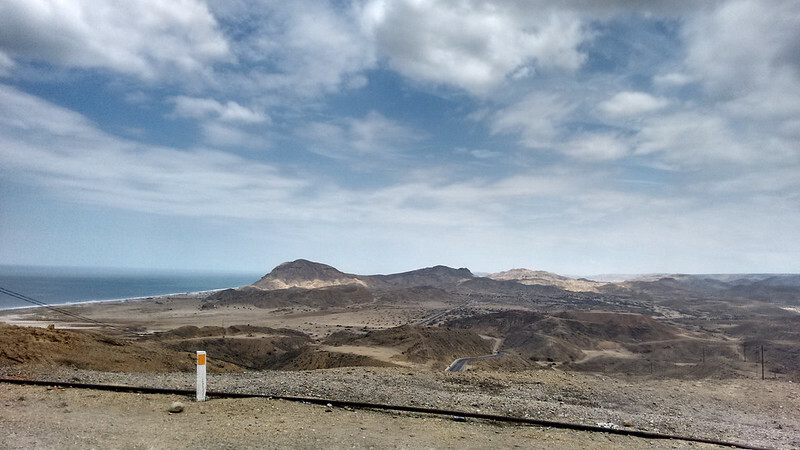 To get to Cabo Blanco, take a Eppo bus from Máncora or Piura to El Alto. It cost S/.2.50 each way in February 2016. From there, ask someone to point you towards the nearby parking lot where the van shuttles leave for Cabo Blanco. It’s basically across the street but not immediately obvious as the pathway is down an alleyway between buildings. They cost S/.3 each way if I remember correctly. If you want to visit Cabo Blanco Fishing Club, you can walk there but I wasn’t comfortable going alone. You can see pictures in this blog post and this Daily Mail article. I read that the hotel is in more decay than that now, with conflicting reports that it’s going to be restored. 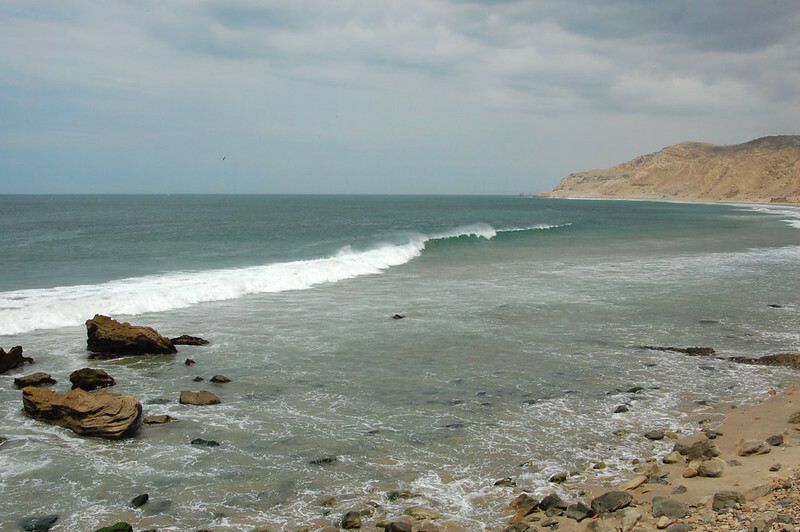 For a little more information about surfing in Cabo Blanco (and the rest of northern Peru), try this blog post. PBS has an interesting article on the giant black marlin and what happened to them. And here’s another nice blog post on the appeal of Cabo Blanco. I tend to keep things positive here on Blueskylimit. There are so many other places on the internet where you can go to get your dose of negative opinions on perfectly nice tourist destinations. Here, I want to encourage you to invest your tourism dollars into the tiny little towns and family owned businesses that inspire me all over South America. 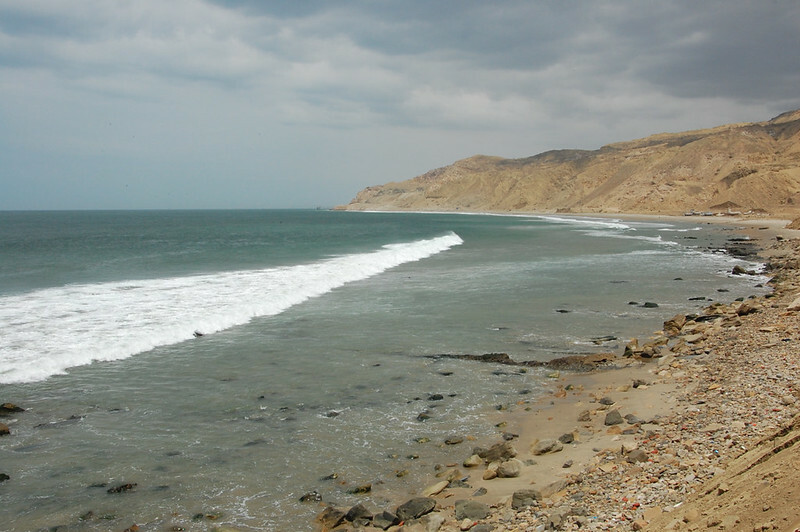 For that reason, I am going to share what my experience of Máncora was like and encourage you to visit Zorritos, Punta Sal, Cabo Blanco, or any other number of beaches in northern Peru instead. I am sure that Máncora was once a beautiful fishing village with pristine white beaches that only drew the most dedicated surfers and intrepid travelers. In fact, it may have still had some of that vibe back in 2007 when I first heard about it. Well, those days are long gone. Today, Máncora is a crowded, overpriced, loud, dirty stretch of roads, filled with party hostels and hustlers, drunk travelers, and half-built buildings that were either abandoned for lack of funds or kept in a constant state of construction for tax breaks. I’m sure the beach is much more appealing on a sunny day, and if you go with a group of friends and you want easy access to pretty good food and plentiful alcohol, this may be the place for you. If you want to stay at some of the fanciest hostels in South America, where everything is provided on-site and you don’t have to leave, you might appreciate Máncora more than I did. Similarly, if you have access to expensive hotels with five star restaurants, your experience of Máncora will probably be much different than mine. But as your average solo traveler who has lost interest in the party scene, Máncora wasn’t for me. 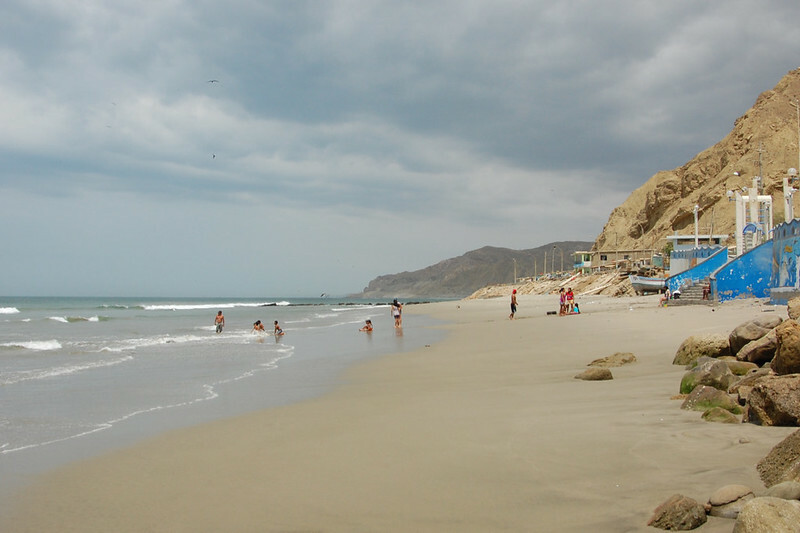 Not with miles and miles of gorgeous coastline to explore throughout Tumbes and Piura, and pristine beaches just a short colectivo ride away in nearby Punta Sal. Instead of Máncora, why not visit the other amazing beaches that I’ll be describing in the following posts? 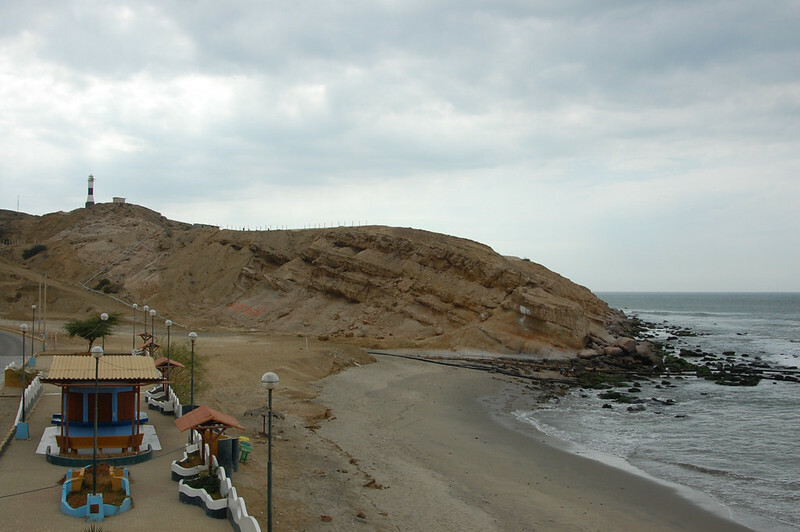 Actually take some time to travel around Tumbes, visit the mangroves, and check out Cabeza de Vaca, one of the most important archeological sites in this region. Visit one of the cleaner, less crowded beaches near Máncora that are accessible on public buses and actually enjoy relaxing on the coast. To be completely fair, I went when El Niño was blanketing the coast in clouds, and I’m sure some sunshine would have brightened up the beaches and made them more appealing. But did you see that decaying boardwalk whose shoddy construction has made it sink into the sand, creating a hazard in the middle of the most popular, most accessible public beach? No thanks, Máncora. 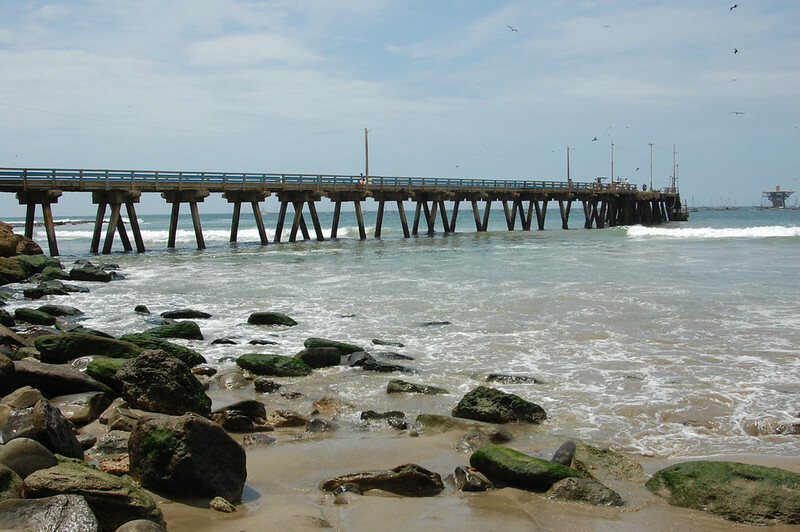 Check out some of the other nearby beaches that I link to below. I spent only a few hours in Máncora, just enough time to have lunch at the delicious vegetarian restaurant, Angela’s Place, and walk around the beach for a while. 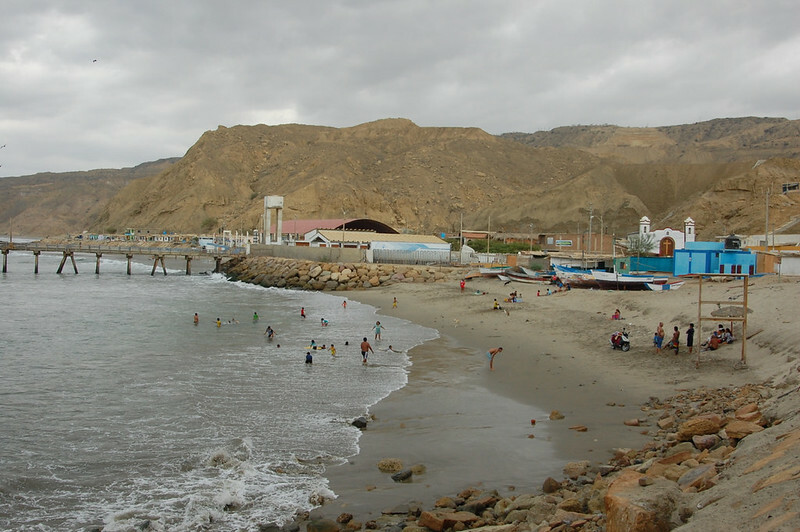 Because of its popularity as a destination, Máncora has become a transit hub for the region, and the colectivo vans from Tumbes end their route in Máncora, where you’ll need to make a connection onward to El Alto, to visit Cabo Blanco, or to the city of Piura. If you want to get away from the beaches of Máncora, Las Pocitas, Los Órganos, Vichayito, and Ñuro all came highly recommended. Los Órganos is easy to get to because the EPPO buses from Máncora have a station there. From the bus terminal, you can catch a colectivo or maybe even a mototaxi to the beaches. Beyond Máncora, you can take an EPPO bus to El Alto, where you can catch a regularly running colectivo van to Cabo Blanco, one of the most beautiful beaches in the area. I’ll be writing more in an upcoming post. If you really want to avoid Máncora but don’t want to head all the way north to Tumbes (though you totally should give Tumbes some time! 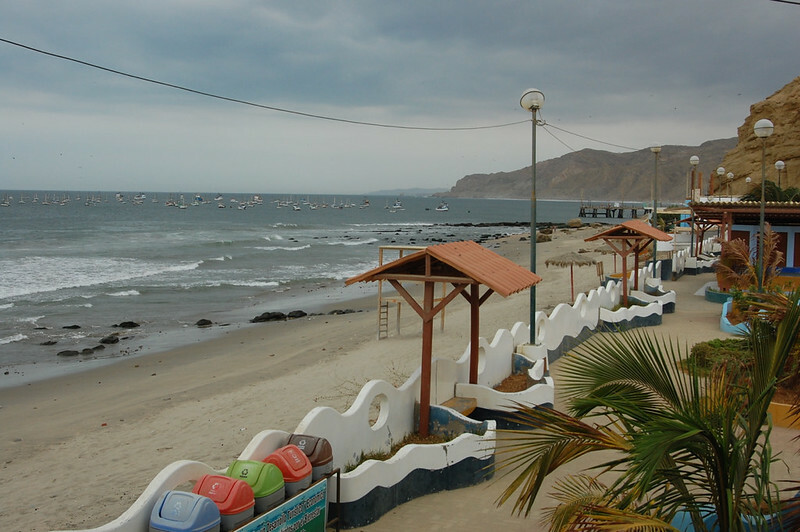 ), Lobitos is one of the most popular surfing towns in Piura, and Colán is also highly recommended by friends. 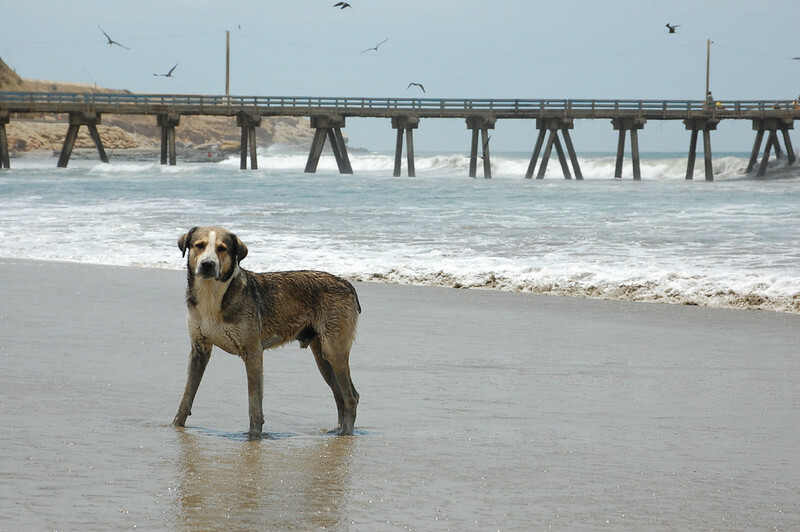 You can access Lobitos from Talara and Colán from the city of Piura. Note that I haven’t been yet; they’re pending for a future trip!